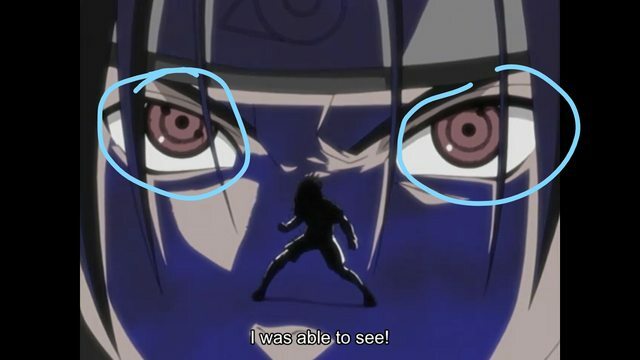 What are the dots inside the eyes when someone uses Sharingan? This was during the fight with Haku, the first time Sasuke's Sharingan showed up in season 1. As you can see, his right eye has two black dots and the left has one. 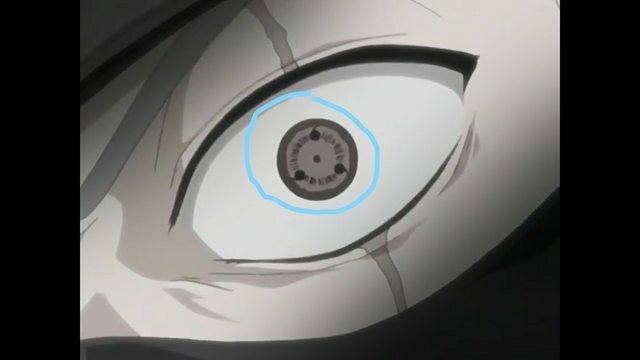 Kakashi's eye has three dots and this was during a battle with Zabuza, the same season a few episodes earlier before Sasuke's Sharingan showed up when fighting with Haku. These dots are called tomoe. When first awakened, each Sharingan usually will have only one tomoe (巴). Through training and continued use, the Sharingan will develop a second tomoe and then, upon full maturation, a third. All the Sharingan's abilities are available to the user from its earliest stage, but with greater development comes greater proficiency with those abilities. For example during their first fight in the Valley of the End Sasuke was able to easily see Narutos movements after obtaining the third tomoe in one of his eyes, when he couldn't dodge them at all earlier. How does Obito have two Sharingans if Madara took one? Why did Kakashi not kill Hidan? How does Madara have Rinnegan in both eyes? Do Sharingan users experience its full potential when having mixed stages of eyes? How did Itachi get affected by Kotoamatsukami?